Lion, representing China, is shown devouring Tibetan lamb while U.N. looks on. WASHINGTON—Tibetan schoolchildren, refugees in India for much of their lives, have a found a way to express their yearning for home in art. “Feelings From Tibet,” an exhibition of paintings by students of the Tibetan Children’s Village School Suja, was held on Aug. 16-17 at the school’s facility in Bir, in northern India. The artists ranged in age from 6-17. More than 300 students and staff from the school attended, along with guests from other schools. Project organizer Ngawang Tseten, a teacher at the Suja school, said that he and fellow teacher Tenzin Dhargyal have worked at the school for more than 10 years. “We thought it would be good if we could offer an opportunity for that group of students to express their feelings [in this way],” he said. Ngawang Tseten said that he and Tenzin Dhargyal sought funding for the project from the Dalai Lama’s Foundation for Universal Responsibility—an India-based nonprofit organization established with the Nobel Peace Prize awarded to the Dalai Lama in 1989. “We knew about the Foundation and how they fund original projects like ours,” Ngawang Tseten said. The Foundation quickly agreed to back the competition. “Individual Tibetan voices need to be nurtured and encouraged,” he said. 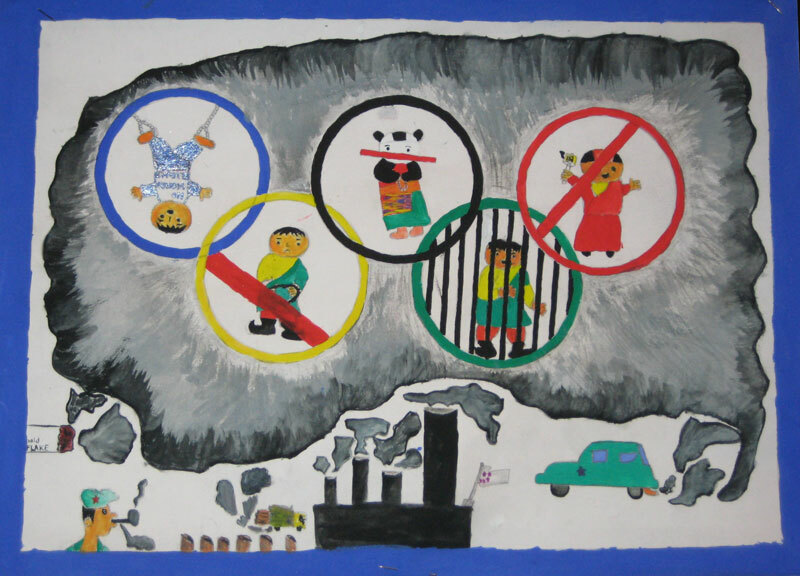 Paintings entered in the competition were produced to illustrate particular themes, such as Tibet’s environment, animal rights, children’s rights, and the Olympic Games in Beijing. Other paintings on exhibit displayed a sophisticated understanding of world affairs. In one, a lion draped in a Chinese flag devours a lamb representing Tibet, while another animal, representing the United Nations, looks on without concern. 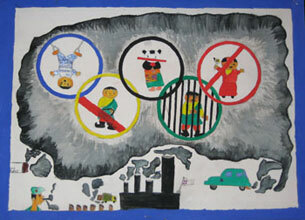 In another, Olympic rings encircle captive figures while dark clouds of pollution rise from the smokestacks of a Chinese factory. Organizer Tenzin Dhargyal said that the three best artists for each category were selected. Thirty-one were awarded prizes of books, paper, ink, pens and pencils, and other drawing supplies. 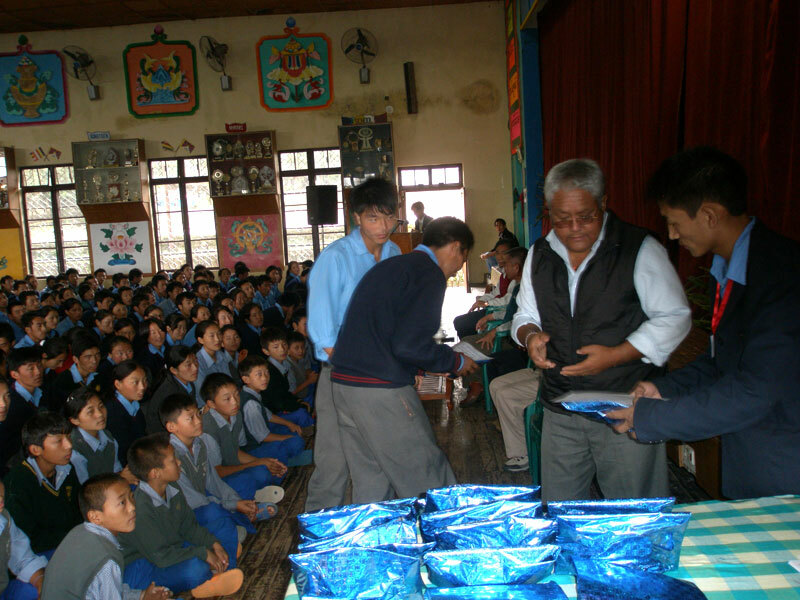 “Along with the prizes, they were given certificates with the Foundation logo and the signature of the school principal,” Tenzin Dhargyal said. Elizabeth Carll, a stress and trauma psychologist in New York, agreed that it is often easier for children, “particularly if they’re younger children and don’t have the language to express their emotions,” to communicate their feelings and thoughts through art. The Suja school paintings portraying political themes are “remarkable,” though, she said. Original reporting by RFA's Tibetan service. Tibetan service director: Jigme Ngapo. Translations by Karma Dorjee. Written in English for the Web with additional reporting by Richard Finney.